Disclosure: I am an official ambassador for Dole Fresh Fruit and Fresh Vegetables. Dole is passionate about bringing healthier foods to families. Last year, Dole collaborated with Disney to create Disney•Pixar Cars 3 themed recipes, as well as Cars 3 themed packaging (such as character stickers on bananas, Cars 3-themed tags on pineapples, etc). Just having those little character touches and recipe inspirations encourages kids to eat healthier and try fresh fruits and vegetables. This year, Dole is celebrating another movie event with “Powering the Hero Within,” a 15-week long healthy-eating collaboration inspired by Disney•Pixar Incredibles 2. The collaboration includes numerous recipes using DOLE ® fresh produce in various inspired breakfast, entree, snack, and drink recipes. You will even be able to find Incredibles 2-character images on DOLE® Bananas and Pineapples in the U.S. and Canada. The recipes are available at Dole.com/Disney. In addition to the Incredibles 2-themed nutritious recipes, you can find the Action for Healthy Kids campaign on the webpage, where with each photo uploaded from May 24-September 15, 2018 Dole will make a donation of $2 to Action for Healthy Kids, a nonprofit that works to build healthier families, communities, and schools. Place the sliced bananas into a large zip lock bag. Remove as much air out of the bag as possible and zip closed. Place the bag into the freezer for at least 2 hours or overnight. Remove the bag from the freezer and add the frozen bananas into a food processor. Blend until smooth, scraping down every 30 seconds, until the banana looks like soft serve ice cream (this might take 3 to 4 minutes). Add the peanut butter and blend until smooth or fold in to make a swirl effect. Then, pop into a zip lock bag and freeze until needed. Combine the balsamic vinegar, honey and half of the mint leaves in a bowl. Add the strawberries and mix well. Set aside at room temperature for 10 minutes to marinate. 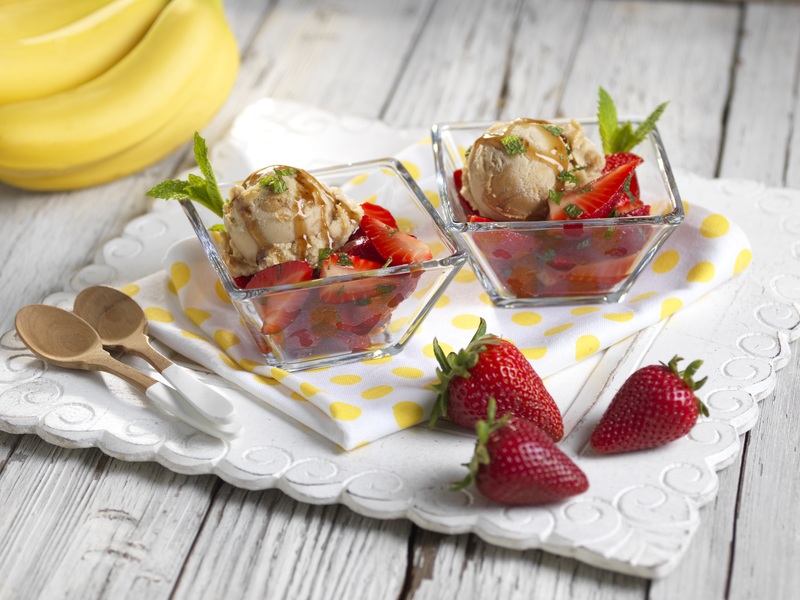 To serve, divide the strawberries among 6 small bowls, topping each with one scoop of banana ice cream. Sprinkle the remaining mint leaves over to garnish. Place the cubed pineapple and strawberries in a small bowl and pour the balsamic vinegar and honey over the fruit. Stir to coat. Allow to macerate for at least 15 minutes. To assemble, take a large salad bowl and spoon in the cold farro. Stir in half the chopped herbs, oil, and cheese. Scatter the other half of the herb and cheese mixture over the pineapple and strawberries and serve. Season to taste with salt and pepper, if needed. Peel bananas; slice into blender container or food processor. Peel oranges; cut into chunks. Add to blender with yogurt, cinnamon and nutmeg. Cover and blend until smooth. For the rest of the Incredibles 2 inspired recipes and complete nutritional information, visit Dole.com/Disney. Desert Vacation Villas in Palm Springs – The Best Family Resort!